Despite the dark and cold weather on Wednesday evening, Wilfrid Laurier University’s Rainbow Centre displayed its cheerfulness and optimism as it hosted its second annual Queer Pride Parade. The march started at the Quad around 6:30 p.m. and worked its way throughout campus, which included marching along the side of University Avenue before finishing back in the Quad. 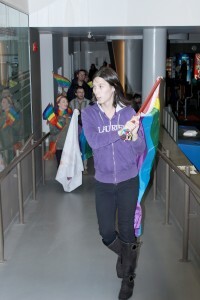 The parade was the conclusion to the Queer Awareness campaign, a week-long campaign that promoted the centre and brought awareness to queer issues and the presence of the queer community at Laurier. Pamela Sariyannis, events coordinator for the centre, viewed the parade and campaign as tying directly into the goals of the Rainbow Centre. “The goal of the Rainbow Centre this year is to build more ties with the community and that goal was reached in this year’s pride parade,” Sariyannis said. The reason behind this success, she believes, is due to the support of various other groups on campus. Shawn Johnston, who is currently completing his Masters of social work and is a work student at the Aboriginal Student Centre, participated in this year’s parade. “I think it’s important to support other LGBTQ [lesbian, gay, bisexual, transgender and queer] students on campus through events like the parade,” he said. Speaking about the importance of the parade on campus, Johnston expressed that it relates to the services provided by groups like the Rainbow Centre. While the number of participants was not as high as last year, Mennen believes the support from various groups who were not visible last year was an improvement. “More people came out last year, but I think the people that came out this year were more aware of why we were doing it,” expressed Mennen. The parade was held a month later than it was last year, which impacted the conditions for the parade as it was getting dark by the time it began. As such, Mennen commented on the challenge they had with timing this year. “The hardest part is finding a good time which works for students’ schedules. It’s hard finding a time when everybody can come out,” Mennen said. Looking at the overall impression of the parade on campus, Mennen thought it was well-received by the student community. “I saw two things from people on campus during the parade: bewilderment, in terms of people not knowing what is going on, and positive reception from a lot of people who smiled and cheered with us,” she said.